I did it. I completed a marathon. My official time was 5 hours, 2 minutes and 8 seconds. I was hoping to finish under 5 hours but a popped blister on my little toe that needed a little attention slowed me down a little. But I can't complain one bit because I finished a freaking marathon. As painful and exhausting an experience that it was, it was one that I will cherish forever (and might consider doing again). It was 2 years ago yesterday that I started this blog. I've had a few lows along the way but a lot more highs. I need to finish thanking a few people. I want to make sure I thank my family. They had to put up with me for the last 18 weeks running 4 days a week with the mileage increasing week by week. It did cause some hardships as my fellow marathoner, Todd, said it was like a part-time job. Thank you to my wife, Jessica, for all of her support through all of this. I know she's happy to have me back as a full-time husband and father to our little Luke and Lauren. I know she was my biggest cheerleader through all of this. And thanks to my folks, relatives, in-laws, and friends. Your words of encouragement kept me going. And now I want to thank my fellow marathoners, Chris, Todd and Kara. Way back in April or May I came up with the idea of running a marathon. I wasn't sure I would be able to do it but given enough time, I knew there was a chance. In what might have been a weak moment, they said they would do it too. All three of them have been running for a long time. Chris has one marathon under his belt, Todd has three and this would be Kara's first one. I started my training in May, injured myself in early June and was out for a couple weeks, did a race here and there throughout the summer. 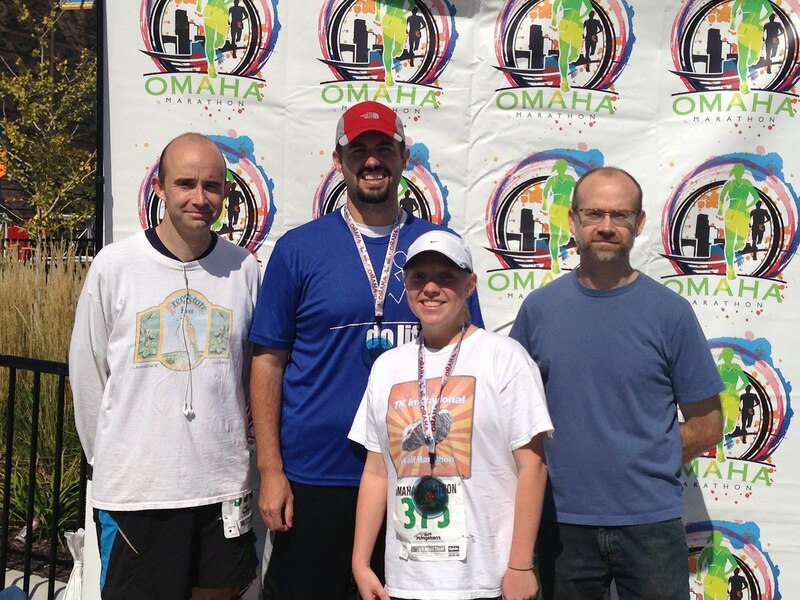 And it all culminated with a 26.2 run around east Omaha yesterday. I was filled with all sorts of emotion in the last few miles. It even caused me to shed a few tears. I felt like screaming "FREEDOM!" at the top of my lungs like William Wallace minus the disembowelment and beheading. It was truly an amazing feeling of accomplishment. 2 years ago, when I ran my first 5k (barely), Chris was there for support and did it with me. When I ran, he ran. When I walked, he walked. Yesterday, Chris, Kara and I all started out together. Kara ran on ahead of us and Chris stayed with me, just like he did 2 years ago. This time he did it for 26.2 miles instead of 3.1. That sort of friendship and support will stick with me for the rest of my life I hope I can pay it forward. Well, it's almost here. The Omaha Marathon is this Sunday. Nerves haven't kicked in yet. Still plenty of time for that. I haven't posted in the last 2 months and quite a bit has happened in the last 2 or 3 weeks alone. On Labor Day, I woke up from a short nap with severe chest pain. It also included shortness of breath and I could barely get any words out. I went to the local emergency room to try and figure out what was going on and was sent on to see a cardiologist and observed overnight to make sure everything was ok. Long story short, everything is great with my heart. The day before this occurred I completed the longest run of the training, a 20 mile run. Afterwards, I had a bunch of buffalo wings and other fried foods in celebration of a friend's birthday and I'm fairly certain that contributed to my chest pain. My doctor thinks it could be GERD or what's called a nutcracker esophagus. It could also be a gallbladder problem but it can wait until after I'm done with the marathon before figuring that out for sure. This past Saturday, I ran the 6th Annual Raider Run. I ran the 10k this year. It was this very race 2 years ago when I ran my very first race ever, a 5k. Before, during and after the race, I thought a lot about where I've been and what I've done in the last 2 years. And how I have a lot of people to thank - for their help and for their inspiration. So I'm just going to start writing and putting words to the text box as they come to me. First, I want to thank Ben Davis. Without his video, his story, his blog, I wouldn't have had that final push to finally do something about my life and get this ball rolling. Next I want to thank my friend, Chris King. He ran my first 5k with me 2 years ago. When I couldn't run or needed a break, he walked with me. When I ran, he stayed at my side, encouraging me the entire way. Chris is also running the marathon with me on Sunday. I want to thank the various people who have run with me since I started running regularly and during my marathon training. Thank you to Callie and Kara (Kara is running her first marathon in Omaha as well) for our early morning or evening runs during the week or on weekends earlier this year. And thank you to Jina Kugler. Jina was a teacher of mine in high school "a few" years ago and we are friends on Facebook. She had been following my status updates and emailed me one day that if I wanted company on my long runs during my marathon training to let her know. I was hesitant at first because I knew she ran a faster pace than I but she pushed me while I would get her to run longer than she had planned so we both benefited. Another thanks goes to Meghan Kearn. She's a high school classmate of mine who has been running for a while now. She's training for her first official half marathon in October but she ran the TK Invitational with me a week ago on Sunday and she did great. And she's going to do even better next month. We ran the Raider Run 10k together and she helped me run much faster than I intended to and I ended up with my fastest 10k time to date. I have more people to thank but I want to save that for an after marathon posting. That's not entirely true. Yesterday was my first day of running since injuring my right hamstring at the Rib Run 2 on June 2nd. And while my hamstring was appreciative of the time off, the rest of me wasn't. I ran an easy 3 miles yesterday morning and that wasn't too bad. I ran 11+ minute miles. I stretched my hamstring before running, again at miles 1 and 2 and then afterwards. Today was 5 miles but I ran in the evening which was nice and hot, first day of summer and all. I stopped to stretch a few times but I ran the entire distance. I was hurting though, everything except my hamstring anyway. I'm supposed to run 10 miles on Saturday and I really don't know if that's going to happen. I'll definitely go running in the morning when it won't be as hot. I also run better and have more energy. So fingers crossed all goes well. So I didn't go for a run today because of my hamstring being sore. Tomorrow is a scheduled rest day and Saturday's run (regardless of the race) is more important to the marathon training overall. The long runs are more important according to Hal Higdon's training program. I've been icing my hamstring off and on this evening so I'm hoping the combination of that and resting today and tomorrow will be enough time to run on Saturday. Also, I just registered for a Double Half Marathon outside Lincoln, Nebraska this October. Not sure what I just got myself into.